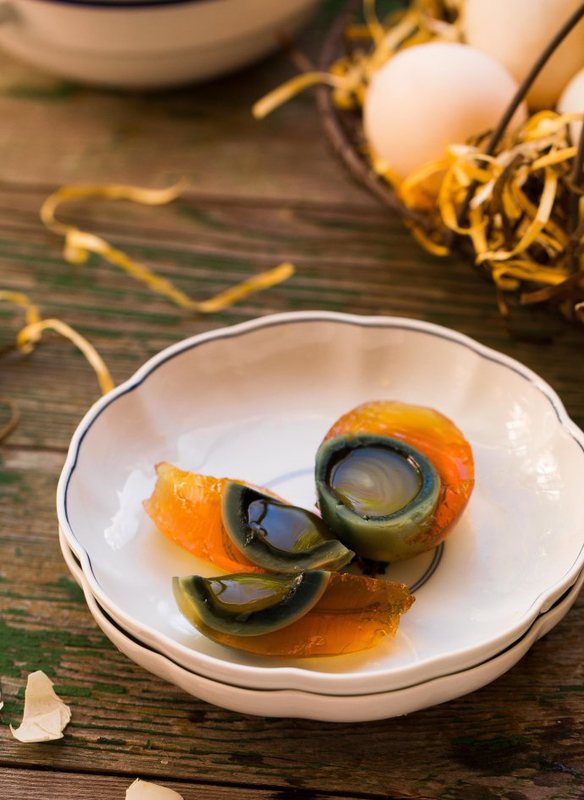 Century Eggs are a legendary Chinese food that, after a special processing method, become jelly-like and often patterned. They also have a special aroma, making them one of China’s favorite foods. For most Chinese people, Century Eggs are deliciously tasty. Duck eggs are usually used, as they taste fresher and are slightly saltier. Also the flavor and color are unique. 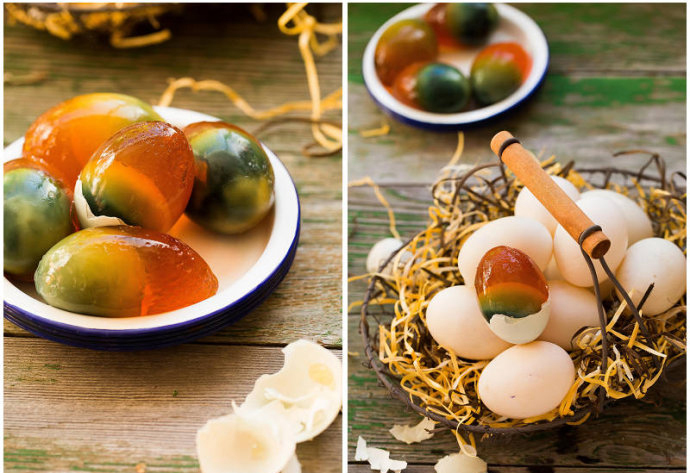 Century Eggs are not only loved at home in China, but also have a good reputation in the international market. 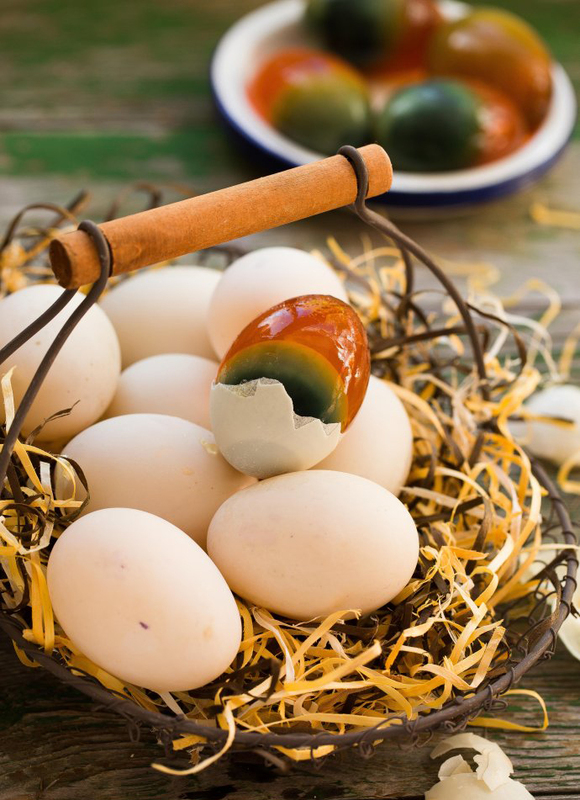 Century Eggs and Salted Duck Eggs have become the most popular flavored eggs in China, and the custom of eating these two kinds of eggs gradually developed from the Dragon Boat Festival. Every time the Dragon Boat Festival arrives, they don’t just have the traditional sticky rice dumplings, but also eat the Salted Duck Eggs and Century Eggs, which are used as gifts for relatives and friends! Eggs sold in the market may contain lead. The so-called unleaded Century Eggs on the market still have lead in them, but is usually of a low content. Eating too much even of these can be harmful. Is it possible to make your own eggs? The answer is yes, and it’s actually very easy. Even if you don’t do it yourself, at least after reading this article, you’ll know how to buy Century Eggs. When processing the traditional Chinese Century Egg, quicklime (CaO) is generally used, as well as soda ash (Na2CO3), grass ash (K2CO3), lead oxide (PbO2) and salt. From the above equation, you can see that the key ingredients for making Century Eggs are sodium hydroxide and potassium hydroxide. These two strong bases slowly penetrate through the porous eggshells and react with proteins in the egg white and yolk to denature, coagulate and decompose, releasing a small amount of hydrogen sulfide gas and ammonia. Strong bases and protein-constituting amino acids produce salt crystals, which fan out over the surface of the egg resembling beautiful snowflake-like patterns. Hydrogen sulfide and the metal elements in the egg white and yolk produce various sulphides that discolor the egg white and yolk. Salt and alkali can kill microorganisms in the Century Eggs, which can achieve a long-term anti-corrosion effect. So, keeping the eggs preserved for a long time will not do any harm. Salt not only increases the taste of Century Eggs, but it also makes them easier to peel. So, why the addition of lead oxide? According to the secret of the electron microscope, lead oxide can seal the pores on the shell (if there are black dots on the inner side of the shell, they contain lead or other heavy metals). There will be no black dots if no metals are added. Lead oxide closes the pores on the eggshell, which prevents oxygen from entering the Century Egg. Oxygen oxidizes the eggs and turns them yellow. Another purpose it is used for is to prevent the coagulated protein from being hydrolyzed by the action of strong bases. Is it possible to make homemade century eggs without lead oxide? The answer is yes! The comparison experiment is shown below. 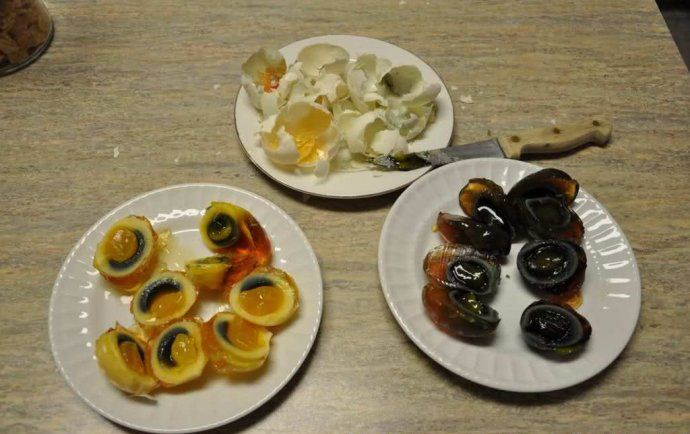 Half of these homemade Century Eggs were vacuum-packed, and the other half were not vacuum-packed. The nonvacuum-packed eggs are on the left and the vacuum-packed eggs are on the right. The inside and outside of the vacuum-packed eggs are black and look more appealing. Because of this, they are typically made and sold using this method. The nonvacuum-packed eggs are oxidized and so have turned yellow. This doesn’t affect the taste, but because the black ones look better, that is how they’re usually made. If you don’t have any vacuum packaging, you can use melted wax, which also seals the pores. But if you are eating these in your own home and you don’t care about the color of the eggs, you will not have to use either of these methods! Having said so much, how can unleaded Century Eggs be made? Below is my recipe on how to make them. Everything, from composition to operation, is incredibly simple! Place the water, salt, and sodium hydroxide in a large plastic container. Sodium hydroxide is a strong base, so be sure to wear plastic gloves and be careful not to splash it on your skin, eyes or clothes. Also, you must make sure you do not put the sodium hydroxide solution in a glass container. Carefully place the fresh eggs in the sodium hydroxide solution. You can put 20-25 duck eggs in without any problems. Seal, and let the eggs sit for three weeks at room temperature, while the egg whites solidify. After three weeks, open the container and check the progress by tapping one egg to see how much it has firmed up. If the egg white is solid, remove it and rinse it, then place it back in the container with the others for one more week. If the egg white has not firmed up, extend the preservation time. My homemade Century Eggs have been made several times using quail eggs. Preserving the quail eggs does not take as long as duck eggs (usually only about two weeks). After you have successfully made these eggs several times, it is possible to add flavors such as tea to the solution that the eggs are preserved in. This method is simple and reliable. 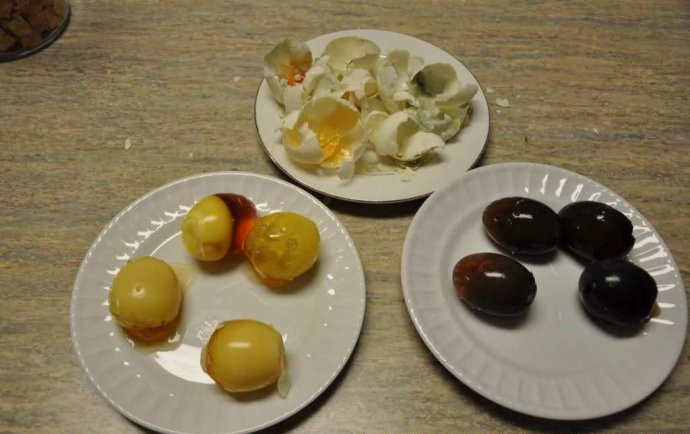 The following figure shows a few Century Eggs I have made. I opened the container in the middle of the three weeks preservation time and gently tapped the eggs to check whether they had solidified. This gradual process forms lovely snowflake-like patterns over the surface of the egg, making them even more special. Because I did not vacuum-pack these eggs, they were oxidized yellow from inside to outside, but that did not affect the taste! 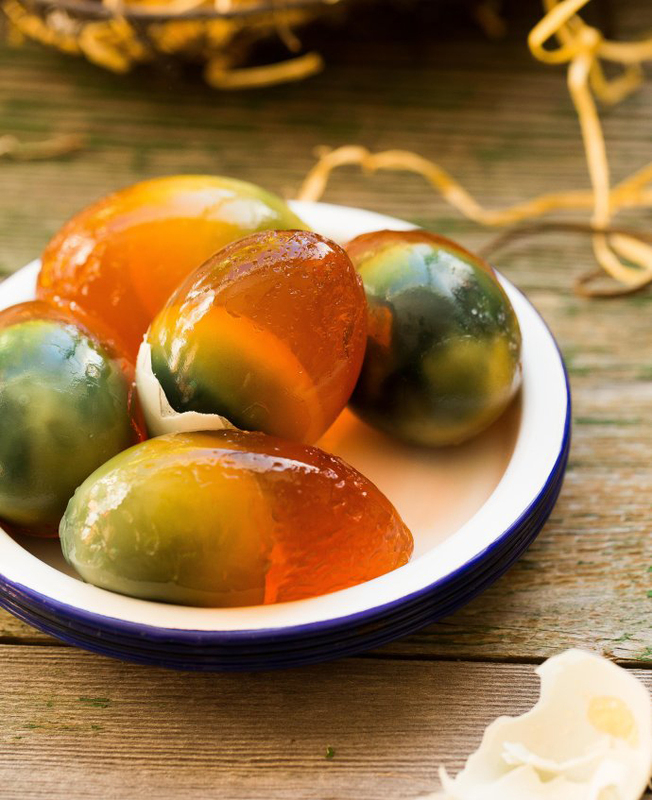 Century Eggs are full of moisture. If stored in the refrigerator, the water will gradually go way too cold, thus changing the original flavor of the eggs. In addition, low-temperature preservation will also affect the color of the Century Eggs and will actually make them turn yellow more easily. So, it is not advisable to store the eggs in the refrigerator. 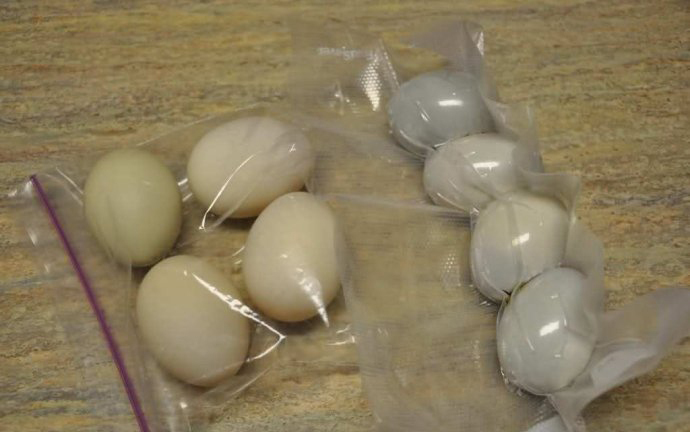 If you have leftover Century Eggs in the house that cannot be eaten or need to be preserved for some time, they can be placed in plastic bags and stored in a cool and ventilated place. Generally, they can be preserved for about 3 months without change in flavor. I am going to try it now. Just a hint: “edible sodium hydroxide” in the recipe might be lethal for stupid people. Hi Tiana, thanks for the recipe and the chemistry course! 🙂 What is the concentration of the sodium hydroxide that you used? Thanks! In fact, you can buy sodium hydroxide from amazon. Hi Tiana, thanks you so much for your sharing. Its very helpfl. I really wang to learn how to make the century egg. Can i have your email address please so i can get more advices from you? Great website and recipes! Thanks so much for sharing the knowlege and skills. I’m a big fan of century eggs. Was wondering at what stage do you vacuum pack the eggs? After the egg white has firmed up? Many thanks! I am a big fan of century eggs (I just now had one (sliced) with chopped salted chiles and toasted sesame oil on water crackers) but I have never tried to make them, I really should. Do you know if it is possible to use emu eggs? Would the NaOH penetrate to the center of such large eggs? > Do you know if it is possible to use emu eggs? Yes, but it will take much, much longer, perhaps so long that the egg wastes in the meantime. Time estimate in weeks: 3*(diameter of emu egg)/(diameter of duck egg). Hi John, I am not sure, I haven’t used emu eggs before. But I think you can have a try, good luck, thanks.